Have you ever ride an Electric Scooter? It seems like a lot of fun. With increased hassle surrounding commute, electric scooters are an excellent way to get around without worrying about traffic. They are fast, comfortable, and go the mile when it comes to short distance travel. Electric scooters are also friendly to the environment. And if you are environmentally conscious, buying an electric scooter can go a long way in reducing carbon footprint. The good thing is that they do not need any specialized training or an insurance policy. The price is also low and affordable for most people. Today, we look at the best choices there is on the electric scooter market. 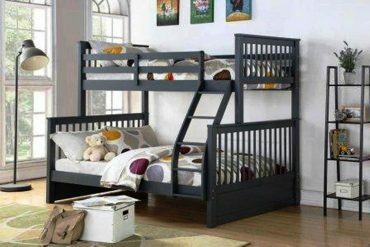 These models are offered at different price points and are fit for different categories. You will find scooters for the commute as well as models for kids, hills and rugged paths. 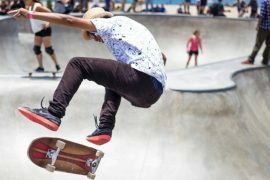 You will also find guidelines on buying the Best Electric Scooters and basic traffic rules and safety tips at the end of the article. Now look at the best choice from affordable Razor’s to World’s Fastest Electric Scooter model as you scroll down. Featuring 8.5-inch pneumatic wheels, the GOTRAX GXL Commuting Electric Scooter is the ultimate scooter for hitting the road every day for the commute. It’s a high-performance scooter designed to take on rugged paths while you have your fun. 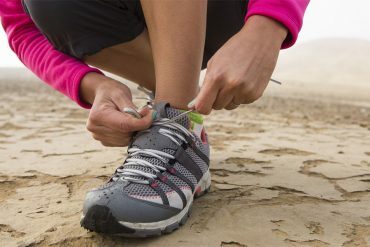 The tires boast anti-slip treads coupled with excellent shock absorption. It can support a weight of 220 pounds meaning most riders will get a smooth ride. 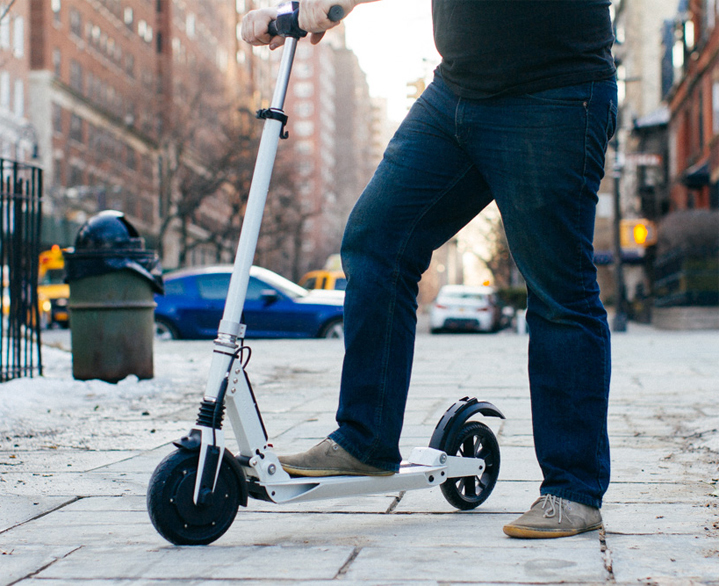 You won’t just be using this scooter for the commute. It is also a nice choice for running errands like picking groceries. You get a powerful ride thanks to the 250W motor. It offers up to 15mph top speed so you can go further and get to work on time. With the 36V battery, you get up to 12.5 miles of range on a single charge. And to recharge this scooter, you need only 4 hours. We like that this scooter folds and locks down for storage. It is a nice touch to protect your scooter if you park it in a public place. Not to mention it can store in tight places if you live in a small apartment. Do your kids love cruising the neighborhood? 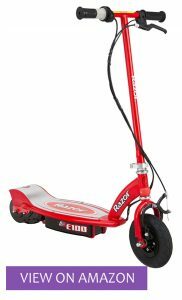 Razor E100 electric scooter is the perfect gift for Christmas this year. 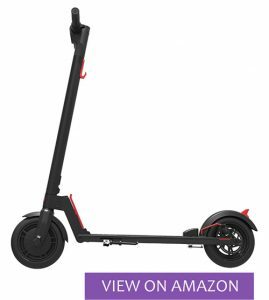 From a brand that has continually proved to be top of its game, this scooter is a balance of speed and affordability. The scooter comes with two 12V batteries that are safe to use even at its top speed. Razor uses 8-inch tires pneumatic tires that guarantee a safe and smooth ride. It can achieve high speeds of up to 10mph. 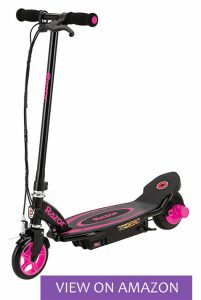 If you have kids in their early teens, they will love their ride on the Razor E100. With a chain-driven motor, the scooter is all in when it comes to a quiet ride that is emission-free. Your neighbors will also love that they do not have to hear the scooter ride by as it is very silent. What’s more, this scooter has a twist grip throttle complemented by a hand front brake to ensure it stops smoothly when it is engaged. To top it off, there’s the retractable kickstand that comes in handy for on and off riders. Designed for teens from the age of 13, it is easy to see why the Razor Pocket Mod Miniature Euro is loved. It can pick up speeds at up to 15mph which is quite adorable. The step-through design allows for a comfortable sitting space with enough leg room. This way, you can ride for the full 40 minutes without your knees aching. 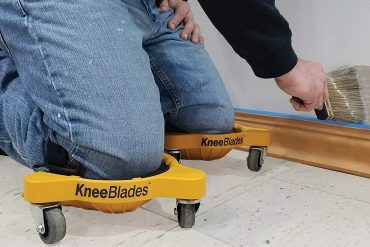 This scooter comes with 12-inch pneumatic tires. It provides perhaps the most comfortable ride for the money. Not to mention, it is vintage inspired while owing to the chain-driven motor and ability to achieve high torque. It can ride on beaten paths and offers a hand-operated brake to give you just the right stopping power. Razor Pocket Mod Miniature Euro explores a low profile. It can support riders up to 170 pounds. You will like it for just about any teenager as they fit the weight limit. And seeing that it has a construction from steel, it is apparent the kind of durability you will be getting from this scooter. Another important feature is the retractable kickstand and under seat carriage. You can bring a water bottle to your rides thanks to the extra space. If you choose the Sweet Pea model, you will get a sports bell and handlebar streamer available for girls. It is such a sweet way to customize your teen’s ride. Orscotter is a unique electric scooter. It looks like a superbike with a deck. This scooter clocks up to 55mph. That is quite high and admirable if your love is for speed. 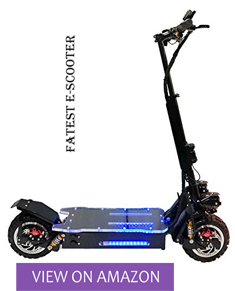 It is a heavy-duty scooter that will outperform just about any other scooter on the market in terms of speed. This scooter comes with a 3200W motor. That is two 1600W brushless motors. They power this scooter to give you insane top speeds and go even further. It has two off-road wheels that are intent on getting anywhere no matter the type of road. From hills to deadbeat paths and tarmac roads replete with potholes, this is the scooter to beat it all. 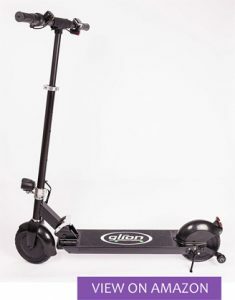 The aluminum and ferroalloy construction material improves the durability of this scooter such that it can take a beating while supporting a high maximum capacity. It’s incredible to find that the 60V battery needs only 7 hours to recharge. You can charge it overnight and have it ready to ride in the morning. The motor is brushless. It needs the least maintenance since it has few moving parts. Friction is reduced, and the parts do not heat up like riding a regular scooter. As such, you won’t need to go heavy on the oiling and to replace parts after every few miles. This scooter can also ride at night. The deck lights up in blue LED, and you have a DB headlight as well as a rear flashing light. This way rider can see you, and you can see other motorists. Razor has managed to deliver a well-thought-out model that gets you riding for longer. The Razor Power Core E90 gets you up to 80 minutes of riding time. This is more than double the time you get from other scooters. It utilizes Razor’s exclusive power core technology to deliver increased speeds and more power for the most enjoyable rides. 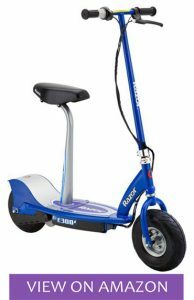 This scooter is ideal for kids between the ages of 8-13. With a max speed of 10mph, it is just perfect to offer the thrill of being on two wheels. The scooter is perfectly balanced and virtually maintenance-free. 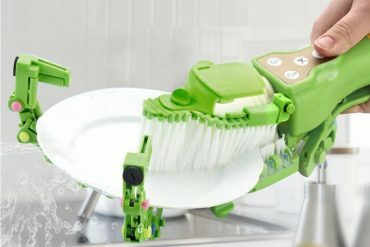 It does not have any chains, so there’s no need to use a chain tensioner or oil the parts. Razor Power Core E90 comes with a kick-start, in-wheel hub motor, and a push-button throttle. It is pretty easy to get it going. And since it uses less energy, your fun lasts even longer. Adjusting the speed is just as simple using the speed throttle. The lightweight steel frame is all in when it comes to powering through rough patches and supporting your weight. It resists any bending in case of impact. It is bound to last in good condition for the longest time. The front brake is hand-operated. It engages smoothly even when being used by young riders. Whether riding around a bend or going downhill at top speeds, it can stop with no hassle at all. Assembling the Razor Power Core E90 is straightforward. 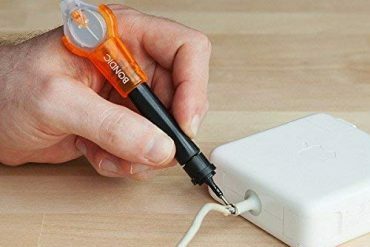 It comes with clear instructions which makes it easy to assemble it out of the box. Razor E300S Seated Electric Scooter offers the most comfortable ride for adult riders. This model has a super-sized deck that you can place both feet and feel comfortable after cruising to work or an errand. And if you want to take it slow and more comfortable, you have a detachable seat that comes in handy for such times. This scooter is designed using 10-inch pneumatic tires. It represents a powerful ride since you won’t be dealing with gas fumes. The scooter uses a chain-driven motor. Although it will require a good level of maintenance, you won’t have to deal with broken filters or a noisy motor that tells your neighbors you are riding by. Razor E300S uses comfortable rubber grips. They are soft, and you will find that it is effortless to engage the rear brake. Even so, you will get a twist grip mechanism that allows you to control the speed the way you like it. When it comes to assembling, you will be done in 10 minutes or less. It has a steel frame and fork that come together without an extra pair of hands. It is such a wonderful experience knowing you have a scooter from a brand that knows a thing or two on making the best electric scooters. Who wouldn’t like to have a ride that can be stowed away fast and smooth? Glion gives you just that exact convenience. It folds flat, and it comes with a storage bag such that you can pack it like a roller bag suitcase. 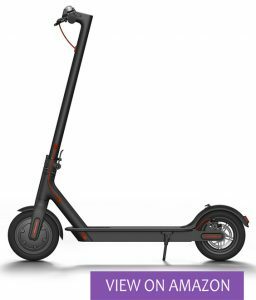 Glion utilizes its patented vertical self-standing feature to ensure your scooter will never fall when you lean it against a wall in the folded position. 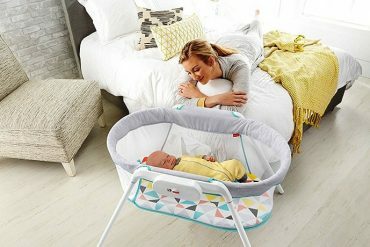 You will also find that it is lightweight weighing in only 28 pounds. It means you never have to deal with a heavy scooter when you want to take it up the stairs. With the 250W brushless motor, it speaks of durability as few parts generate heat. Not to mention, it is gearless and chainless to give you up to 15mph top speed. You have every reason to get this scooter if you commute along rugged roads. This is because it has never-flat airless tires that can handle bumps like a pro. The Glion scooter comes with an electronic antilock maintenance-free brake. It is located in the rear hub motor where it engages using the handbrake. And finally, this scooter has a construction from aircraft-grade, powder-coated aluminum frame. You can depend on it for years of decent performance. Xiaomi is a familiar name in the industry. You will also find their lovely smartwatches and fitness trackers making the list of the top best. The Xiaomi Mi electric scooter comes in a portable design as it weighs only 26.9 pounds. It is one of the lightest and a definite pick if you have to lift it onto trains and up the stairs. This scooter fold nicely meaning it will take the smallest storage space in a squeezed living space. Xiaomi Mi can make 15.5mph top speeds, and it can deliver up to 18.6 miles on a single charge. It has a 250W brushless DC motor that can make the miles. Better still, you get high-capacity lithium batteries that also deliver powerful performance. Xiaomi Mi is a unique model since it features a ride management app. 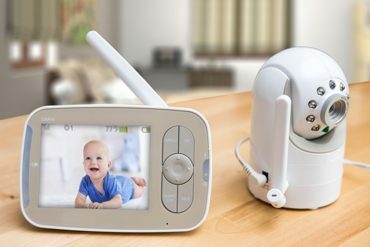 The app pairs seamlessly over Bluetooth. It gives your riding status such as the speed, battery level, and the real-time reading statistics. We like that Xiaomi performs constant updates to their software such that you’ll never miss out on the latest features. With its power to convert and store kinetic energy coupled with its regenerative braking, the battery can go further, and the brakes can engage faster during an emergency. This scooter employs a double braking system. It has regenerative anti-lock braking and disc braking which allows it to engage in as fast as four meters. And, it comes with front headlights and tail light for safe riding after dark. It’s without a doubt that electric scooters come with a lot of benefits. Here are the considerations to make before deciding which one is yours. The battery capacity gives you an idea of how far you can ride on an electric scooter. In reality, the battery life is affected by lots of factors and so is the distance range. You will notice that hills and rugged roads drain the battery faster than riding on smooth paths. You could get a model with swappable batteries such that you can increase your range. 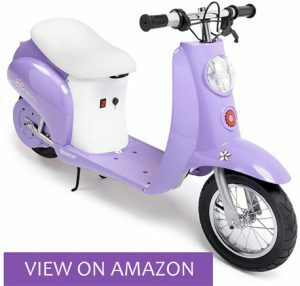 When looking for an adult scooter, the weight limit is also a significant consideration since it differs on different scooters, it also determines how comfortable it will feel. This is because if you are a heavy rider riding a scooter that has a small weight capacity, you will feel every bump in the road even if it has suspension systems designed to soften impact. High-end models have high cruising speeds compared to cheaper models. This is because they employ air wheels and quality suspensions that make them comfortable to ride at high top speeds. When you know the top speed, it is easy to calculate how far the scooter will go on a single charge. In electric scooters, the brand means a lot. This is because you will need to know that the scooter comes from a reputable manufacturer with quality parts that you can get replacements when you want. In any modern electric scooter, you will find it equipped with dual front and rear shocks, a comfortable seat, LED headlights, front and rear disc brakes, a chain drive, and a water-resistant control box. You will want to operate your electric scooter in the best way possible. Apart from having the right parts on your scooter, you will also need a helmet, knee and elbow pads. It is important to check the speed limit as you are not supposed to exceed 15mph on a motorized scooter and 25mph on a public road except if it is a bike lane. You must always obey traffic rules that govern motorized scooters. That is riding in the same direction as traffic and has your learner’s permit or driver’s license on you. You are prohibited from riding on sidewalks or hitchhiking behind another vehicle. You are also not allowed to carry passengers. 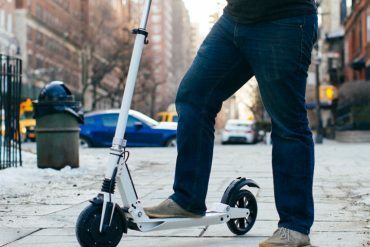 Whether you want to commute on a scooter or want to get an electric scooter for your kids as a Christmas gift, this list represents the Best Electric Scooters on the market. From affordable Razor models to high-speed Orscotter models, you are sure to get one designed to meet your riding needs.